Handrails, mirrors, gate openers and more! Elevators save a lot of trips. 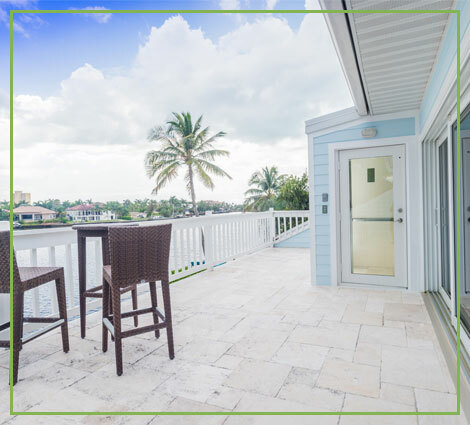 Gulfside Elevator & Cab Interiors specializes in residential elevator installations in new construction projects and existing homes throughout all of Southwest Florida. At Gulfside Elevator, we pride ourselves in our customer service, not only during installation but after the project is done as well. With nearly 200 years of combined experience, we only use non-proprietary systems and provide expert service on almost all elevator makes and models. We are your go-to company to update your cab interiors in your existing residential and commercial cabs. Gulfside Elevator can help you with all your dumbwaiter, stairlift and wheelchair lift needs as well. Feel free to call or email us today for a free estimate and to answer any questions you may have. We look forward to working with you soon! Specializing in residential & commercial elevator repair and service. With over 100 years of combined experience, you can expect the best service from our elevator contractors. If you have stairs that seem to be getting longer, now might be the time to consider a stairlift. Whether your clients need a state-of-the-art elevator installed or want to upgrade their existing elevator, we can provide the right solutions. We’re proud to be Naples’ most experienced and trusted private residential elevator company. We work closely with you to deliver a cab tailored to your exact specifications and needs. Each cab we build is made from the ground up, with the highest quality parts. This is how we guarantee exceptional performance. And, we use non-proprietary systems—allowing us to provide a wider variety of quality equipment at a better value than our competitors. This is a huge advantage. It means you’re not locked into a limited amount of service providers and parts for your elevator. We’re the only elevator company in SWFL to offer completely custom-built cabs. By working with the best and most respected contractors, we deliver beautiful elevators, which operate flawlessly. Our team specializes in revitalizing outdated elevators, providing aesthetic overhauls as well as complete system tune-ups. If your cab is in need of an update, we can help. Certain residential settings require extra accessibility for disabled persons who have difficulties with stairs. We provide stair lifts, platform chairs, wheelchair handicap lifts and more! Our technicians are professional and experienced. They spend the time to find and fix problems before they occur, preventing inconvenient outages and costly repairs.